Mirco Antenucci scored twice as Leeds United ended their five-game winless Championship run with victory over strugglers Bolton Wanderers. Antenucci put Leeds in front when he latched on to Mustapha Carayol's corner and struck past keeper Paul Rachubka. The hosts doubled their advantage when Antenucci curled into the far corner after his initial cross was blocked. Substitute Kaiyne Woolery gave Bolton hope when he fired in Dean Moxey's cross but Leeds held on to win. 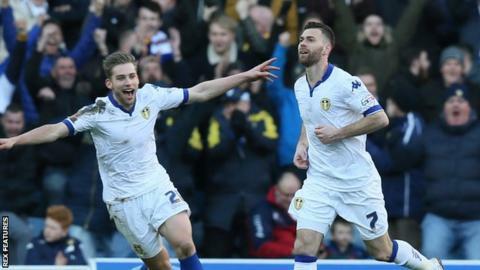 The result, Leeds' first league win since their 1-0 victory against Bristol City in January, eased the pressure on under-fire head coach Steve Evans as his side move up two places to 16th in the Championship. Evans was advised by the club's chairman Massimo Cellino not to talk to the media following their 4-0 defeat by Brighton & Hove Albion on Monday. Meanwhile, Bolton's relegation worries deepen as they drop to the bottom of the league once more and are now 10 points adrift of safety following MK Dons' 2-0 win against QPR with 11 games left to play. Prior to kick off, a Leeds fans' group named "Time To Go Massimo" held a mock funeral outside Elland Road to mark "the death of the club" as a protest towards Cellino. A single-engine plane then flew over the ground, half an hour before the match started, with a banner displaying the message "Time To Go Massimo". Both sides suffered early injuries with Bolton losing Emile Heskey in the warm up whilst Leeds lost Lewie Coyle after 22 minutes when he came off worse following a challenge for the ball with Jay Spearing. Leeds boss Steve Evans when asked if the protests had proved a distraction: "No, none of it. We have to keep our focus on the grass. "At the team meeting at the hotel I said to the players whatever happens we can't affect it. It's not our business. "Our business is to turn up as professional footballers, professional coaching staff and medical staff and support the team on the pitch and get three points. We know if we get the three points we send the Leeds United family home ready to enjoy their Saturday night. " Bolton manager Neil Lennon: "It's been a problem for us all season, we've lacked quality in the final third and that was apparent here. "For all our good approach play we weren't clinical enough. We had Leeds on the back foot for the last 20 minutes. "They had one shot in the second half and it goes in the back of the net. Strikers cost money and we've not got a lot of that this season." Corner, Leeds United. Conceded by Derik. Attempt missed. Rob Holding (Bolton Wanderers) header from the centre of the box misses to the left. Assisted by Stephen Dobbie following a set piece situation. Liam Feeney (Bolton Wanderers) wins a free kick on the right wing. Attempt missed. Stephen Dobbie (Bolton Wanderers) right footed shot from outside the box misses to the left. Assisted by Liam Trotter. Corner, Leeds United. Conceded by Liam Feeney. Attempt blocked. Stephen Dobbie (Bolton Wanderers) right footed shot from outside the box is blocked. Assisted by Rob Holding. Attempt blocked. Liam Trotter (Bolton Wanderers) right footed shot from the left side of the box is blocked. Assisted by Mark Davies. Attempt blocked. Liam Trotter (Bolton Wanderers) right footed shot from the left side of the box is blocked. Delay in match Dean Moxey (Bolton Wanderers) because of an injury. Corner, Bolton Wanderers. Conceded by Gaetano Berardi. Corner, Leeds United. Conceded by Liam Trotter. Attempt blocked. Giuseppe Bellusci (Leeds United) right footed shot from the right side of the box is blocked. Assisted by Mirco Antenucci. Attempt missed. Sol Bamba (Leeds United) header from the left side of the six yard box misses to the right. Assisted by Lewis Cook with a cross following a corner. Substitution, Leeds United. Stuart Dallas replaces Mustapha Carayol. Attempt missed. Zach Clough (Bolton Wanderers) right footed shot from outside the box misses to the left. Assisted by Jay Spearing. Goal! Leeds United 2, Bolton Wanderers 1. Kaiyne Woolery (Bolton Wanderers) right footed shot from the centre of the box to the centre of the goal. Assisted by Dean Moxey with a cross. Foul by Mustapha Carayol (Leeds United). Souleymane Doukara (Leeds United) wins a free kick on the right wing. Foul by Rob Holding (Bolton Wanderers). Toumani Diagouraga (Leeds United) wins a free kick in the defensive half. Souleymane Doukara (Leeds United) wins a free kick on the left wing. Substitution, Bolton Wanderers. Liam Trotter replaces Darren Pratley. Substitution, Bolton Wanderers. Kaiyne Woolery replaces Josh Vela.